WTC07. Collection of Ms. Esther Khor. 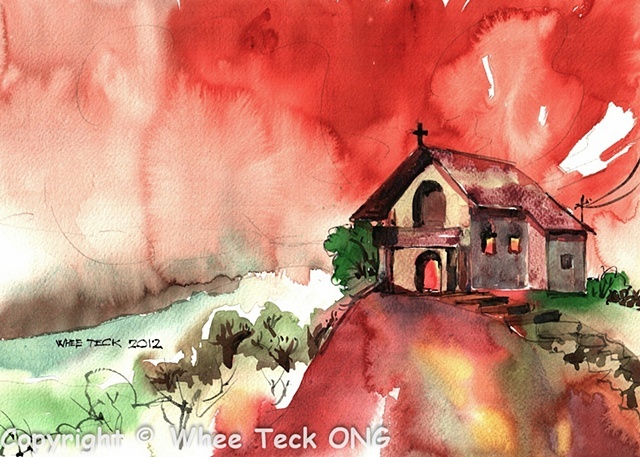 Whee Teck's watercolor on an imaginary church on hill during a bronze sunset. Sometimes Whee Teck is inspired by thoughts on design. This painting was influenced by the Book "The Simple Secret to Better Painting" by Greg Albert. I thought it incredulous that he could claim "How to immediately improve your art with this one rule of composition." but having read it, Greg has some deep but simple insights on composition all beginning artists would benefit.